It can be alarming to be awakened in the middle of the night by a screeching, gritting sound coming from your child’s bedroom. No, it’s not a scene from a horror movie: it’s your child grinding their teeth as they sleep — a behavior so prevalent in children under eleven it’s considered normal. That doesn’t mean, however, you should completely ignore it. While it isn’t harmful for most children, a few can encounter tooth wear, pain or trouble sleeping that calls for some form of intervention. The causes for tooth grinding and similar habits known collectively as bruxism aren’t thoroughly understood, but in children it’s believed linked to the immaturity of the neuromuscular system that controls chewing. Some point to shifts from one stage of sleep to another — more than 80% of grinding episodes occur in lighter stages of sleep and only 5% to 10% during the deeper Rapid-Eye-Movement (REM) stage. It also seems prevalent in children who snore or have other symptoms of sleep apnea. One primary concern is how the behavior can affect teeth, particularly through abnormal wear. The teeth, of course, make hundreds of contacts with each other every day during eating, speaking or jaw movement. If, however, the forces generated during these contacts chronically exceed normal parameters, as with bruxism, it can cause accelerated tooth wear. This can result in a higher susceptibility to tooth decay and appearance changes later in life. 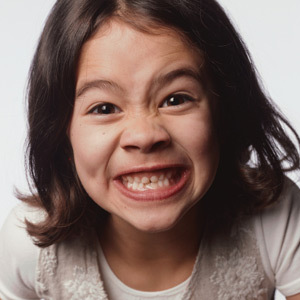 If your child is exhibiting problems associated with teeth grinding, there are ways to address it. We may recommend a thin, plastic mouthguard they wear while sleeping that prevents the teeth from making solid contact with each other. We may also refer you to an ear, nose and throat specialist if we suspect signs of sleep apnea. And, children under severe psychological stress, which can also trigger teeth grinding, could benefit from behavioral therapy. The good news is most grinding habits fade as children enter their teens. In the meantime, keep a watchful eye and see us if you notice any indications this common habit is affecting their health and well-being.